Since joining an enterprise (the world’s largest business-travel company) 6 months ago to drive their DevOps transformation, my ongoing mental evolution regarding the value of technology has gone through an almost religious rebirth. I now think in a completely different way than I did 10 years ago about what technology is important and when you need it. If you want to become a 10x engineer, you need a different perspective than just working on things because they seem cool. It’s about working toward the right outcomes, whereas most of us focus on the inputs (what tech you use, how many hours you work). It all comes down to business value. You need to contribute to one of the core factors of business value, or however incredible the technology is, it just doesn’t make a difference. If you don’t know what that really means, you’re not alone — most of the technologists I know have trouble articulating the business model of their employers. Money. This comes in two flavors. First, you’re creating new efficiency, which increases the profit margin. This could either be through lowering the underlying fixed costs of running the business, or decreasing the cost of goods/services sold by saving a little money on every one. Second, you’re increasing sales, which grows overall revenue. In a cost center within a larger enterprise, or in saturated markets, the former is the most common mode of operation because it’s hard to capture new opportunities. In the latter, it’s about growth mode – investing to capture new value, and often assuming you can make it profitable later. This could be framed as “land and expand” or with the assumption that your company will increase the price and margin once it’s gained a sufficient market share to do so with lower risk. Do you understand your company’s business model? Where does the money come from, who are the customers, what are their needs, what is the sales process and cycle, and what are they buying? Speed. Again, there’s a couple of versions of this that overlap. The overall goals are either initial time to market or speed of iteration. Time to market can come at the expense of significant technical debt, while long-term accelerated iteration cycles are about product-market fit. If you know of the Lean Startup approach promoted by Eric Ries, this should sound familiar. From a long-term perspective, iteration cycles require a balanced approach of customer perspective and technical debt. Otherwise, your company can’t deliver value to customers quickly due to accruing interest on its tech debt. In practice, this can drive an approach that involves gradual refactors with the assumption that long-term rewrites (or e.g. strangler pattern) will be required. It’s the classic “design for 10x but rewrite before 100x,” to paraphrase Google’s Jeff Dean. Risk. As before, this essentially boils down to executing on new opportunity or loss to existing opportunity. Dan McKinley has a fantastic post on why you should choose boring technology, because the important risks are in the business model vs the tech. You should only make a small number of bets on new technology when it will really make a difference in your ability to deliver on business value. For existing opportunity, it’s more about risk avoidance. Typical approaches tend to end up in some mainframe application that one nearly retirement-age developer knows but is afraid to touch. However, a more sustainable model is to implement heavy automation if it truly is a business-critical application that justifies the investment. Relatedly, risk avoidance is where security shines. One of my favorite perspectives is Google’s BeyondCorp model, which assumes your perimeter is compromised and acts accordingly. Strategy. Often not immediately visible in the above approaches, investing in strategic growth opportunities is consistently a great path to success in your business. Do you know your company’s strategy? They probably have posters up and meetings about it all the time. Could you say it out loud? Do you know how it maps to concrete actions? Although any individual opportunity may fail, your contribution to executing on the technology behind that opportunity will not go unnoticed. Similarly, if you’re involved in divesting from areas your employer wants to leave as part of its strategy, you have a real but often smaller opportunity to leave your mark upon the work. Although many other factors have an impact upon business value, those are 4 of the most important ones that can make you consistently successful as a technologist. The key is to understand which ones play into your work, so you can act accordingly in your day-to-day efforts and as part of your career strategy. Are you building software for a cost center, a growth incubator, a risk center, or at a company that cares to invest in speed? Taking full advantage of this approach could make you the 10x engineer you’ve always wanted to be. Best of luck in your journey, and may you spend time where it matters! Got a talk coming up? Want it to go well? Here’s some starting points. I give a lot of talks. Often I’m paid to give them, and I regularly get very high ratings or even awards. But every time I listen to people speaking in public for the first time, or maybe the first few times, I think of some very easy ways for them to vastly improve their talks. Presenter mode is the greatest invention ever. Use it. 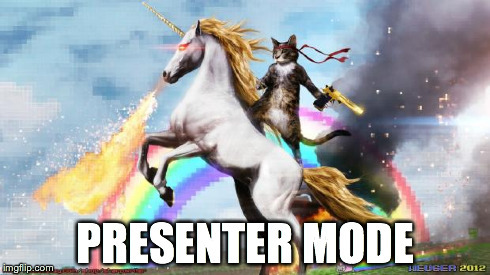 If you ignore or forget everything else in this post, remember the rainbows and unicorns of presenter mode. This magical invention keeps the current slide showing on the projector while your laptop shows something different — the current slide, a small image of the next slide, and your slide notes. The last bit is the key. What I put on my notes is the main points of the current slide, followed by my transition to the next slide. Presentations look a lot more natural when you say the transition before you move to the next slide rather than after. More than anything else, presenter mode dramatically cut down on my prep time, because suddenly I no longer had to rehearse. I had seamless, invisible crib notes while I was up on stage. No bullet points. Ever. (Unless you’re an expert, and you probably aren’t.) We’ve been trained by too many years of boring, sleep-inducing PowerPoint presentations that bullet points equal naptime. Remember presenter mode? Put the bullet points in the slide notes that only you see. If for some reason you think you’re the sole exception to this, at a minimum use visual advances/transitions. (And the only good transition is an instant appear. None of that fading crap.) That makes each point appear on-demand rather than all of them showing up at once. Avoid text-filled slides. When you put a bunch of text in slides, people inevitably read it. And they read it at a different pace than you’re reading it. Because you probably are reading it, which is incredibly boring to listen to. The two different paces mean they can’t really focus on either the words on the slide or the words coming out of your mouth, and your attendees consequently leave having learned less than either of those options alone would’ve left them with. Use lots of really large images. Each slide should be a single concept with very little text, and images are a good way to force yourself to do so. Unless there’s a very good reason, your images should be full-bleed. That means they go past the edges of the slide on all sides. My favorite place to find images is a Flickr advanced search for Creative Commons licenses. Google also has this capability within Search Tools. Sometimes images are code samples, and that’s fine as long as you remember to illustrate only one concept — highlight the important part. Look natural. Get out from behind the podium, so you don’t look like a statue or give the classic podium death-grip (one hand on each side). You’ll want to pick up a wireless slide advancer and make sure you have a wireless lavalier mic, so you can wander around the stage. Remember to work your way back regularly to check on your slide notes, unless you’re fortunate enough to have them on extra monitors around the stage. Talk to a few people in the audience beforehand, if possible, to get yourself comfortable and get a few anecdotes of why people are there and what their background is. Don’t go over time. You can go under, even a lot under, and that’s OK. One of the best talks I ever gave took 22 minutes of a 45-minute slot, and the rest filled up with Q&A. Nobody’s going to mind at all if you use up 30 minutes of that slot, but cutting into their bathroom or coffee break, on the other hand, is incredibly disrespectful to every attendee. This is what watches, and the timer in presenter mode, and clocks, are for. If you don’t have any of those, ask a friend or make a new friend in the front row. You’re the centerpiece. The slides are a prop. If people are always looking at the slides rather than you, chances are you’ve made a mistake. Remember, the focus should be on you, the speaker. If they’re only watching the slides, why didn’t you just post a link to Slideshare or Speakerdeck and call it a day? I’ve given enough talks that I have a good feel on how long my slides will take, and I’m able to adjust on the fly. But if you aren’t sure of that, it might make sense to rehearse. I generally don’t rehearse, because after all, this is the lazy way. If you can manage to do those 8 things, you’ve already come a long way. Good luck! After nearly 12 years working on Gentoo and hearing blathering about how “Gentoo is about choice” and “Gentoo is a metadistribution,” I’ve come to a conclusion to where we need to go if we want to remain viable as a Linux distribution. As Gentoo comes, by default, with a guaranteed-working toolchain, it’s a natural fit for software developers. A few years back, I tried to set up a development environment on Ubuntu. It was unbelievable painful. More recently, I attempted the same on a Mac. Same result — a total nightmare if you aren’t building for Mac or iOS. Gentoo, on the other hand, provides a proven-working development environment because you build everything from scratch as you install the OS. If you need headers or some library, it’s already there. No problem. Whereas I’ve attempted to get all of the barebones dev packages installed on many other systems and it’s been hugely painful. Frankly, I’ve never come across as easy of a dev environment as Gentoo, if you’ve managed to set it up as a user in the first place. And that’s the real problem. Nearly 10 years ago, I founded the high-performance clustering project in Gentoo, because it was a fantastic fit for my needs as an end user in a higher-ed setting. As it turns out, it was also a good fit for a number of other folks, primarily in academia but also including the Adelie Linux team. What we found was that you could get an extra 5% or so of performance out of building everything from scratch. At small scale that sounds absurd, but when that translates into 5-6 digits or more of infrastructure purchases, suddenly it makes a lot more sense. In related environments, I worked on porting v5 of the Linux Terminal Server Project (LTSP) to Gentoo. This was the first version that was distro-native vs pretending to be a custom distro in its own right, and the lightweight footprint of a diskless terminal was a perfect fit for Gentoo. In fact, around the same time I fit Gentoo onto a 1.8MB floppy-disk image, including either the dropbear SSH client or the kdrive X server for a graphical environment. This was only possible through the magic of the ROOT and PORTAGE_CONFIGROOT variables, which you couldn’t find in any other distro. Other distros such as ChromeOS and CoreOS have taken similar advantage of Gentoo’s metadistribution nature to build heavily customized Linux distros. Finally, another key use case for Gentoo is for people who really want to understand how Linux works. Because the installation handbook actually works you through the entire process of installing a Linux distro by hand, you acquire a unique viewpoint and skillset regarding what it takes to run Linux, well beyond what other distros require. In fact I’d argue that it’s a uniquely portable and low-level skillset that you can apply much more broadly than those you could acquire elsewhere. I’ve suggested three core use cases that I think Gentoo should focus on. If it doesn’t fit those use cases, I would suggest that we allow but not specifically dedicate effort to enabling those particulars. We’ve gotten overly deadened to how people want to use Linux, and this is my proposal as to how we could regain it. It’s been a few years, but I used to have an OSCON tradition of getting a bunch of interesting people together for lunch, from a variety of free-software and open-source communities. This year I’m suggesting we do the same, on Wednesday of OSCON week. Let me know in the comments or via email if you’re interested. I’ll also be hosting a RedMonk beering, beginning Wednesday night around 9:30–10pm. Location TBD, watch the Twitters. Update (2013/07/19): Beers will begin around 9:30pm Wednesday at Bailey’s Taproom (213 SW Broadway, which is downtown). The place is open till midnight and we’ll likely be there till then. If you’re a university student, time is running out! You could get paid to hack on Gentoo or other open-source software this summer, but you’ve gotta act now. The deadline to apply for the Google Summer of Code is this Friday. If this sounds like your dream come true, you can find some Gentoo project ideas here and Gentoo’s GSoC homepage here. For non-Gentoo projects, you can scan through the GSoC website to find the details. Data science. Package Hadoop. Package streaming options like Storm. How about related tools like Flume? RabbitMQ is in Gentoo, though. I’ve heard anecdotally that a well-optimized Hadoop-on-Gentoo installation showed double-digit performance increases over the usual Hadoop distributions (i.e., not Linux distributions, but companies specializing in providing Hadoop solutions). Just heard from Tim Harder (radhermit) than he’s got some packages in progress for a lot of this, which is great news. DevOps. This is an area where Gentoo historically did pretty well, in part because our own infrastructure team and the group at the Open Source Lab have run tools like CFEngine and Puppet. But we’re lagging behind the times. We don’t have Jenkins or Travis. Seriously? Although we’ve got Vagrant packaged, for example, we don’t have Veewee. We could be integrating the creation of Vagrant boxes into our release-engineering process. Relatedly: Monitoring. Look for some of the increasingly popular open-source tools today, things like Graphite, StatsD, Logstash, Lumberjack, ElasticSearch, Kibana, Sensu, Tasseo, Descartes, Riemann. None of those are there. Cloud. Public cloud and on-premise IaaS/PaaS. How about IaaS: OpenStack, CloudStack, Eucalyptus, or OpenNebula? Not there, although some work is happening for OpenStack according to Matthew Thode (prometheanfire). How about a PaaS like Cloud Foundry or OpenShift? Nope. None of the Netflix open-source tools are there. On the public side, things are a bit better — we’ve got lots of AWS tools packaged, even stretching to things like Boto. We could be integrating the creation of AWS images into our release engineering to ensure AWS users always have a recent, official Gentoo image. NoSQL. We’ve got a pretty decent set here with some holes. We’ve got Redis, Mongo, and CouchDB not to mention Memcached, but how about graph databases like Neo4j, or other key-value stores like Riak, Cassandra, or Voldemort? Android development. Gentoo is perfect as a development environment. We should be pushing it hard for mobile development, especially Android given its Linux base. There’s a couple of halfhearted wiki pages but that does not an effort make. If the SDKs and related packages are there, the docs need to be there too. Where does Gentoo shine? As a platform for developers, as a platform for flexibility, as a platform to eke every last drop of performance out of a system. All of the above use cases are relevant to at least one of those areas. I’m writing this post because I would love it if anyone else who wants to help Gentoo be more awesome would chip in with packaging in these specific areas. Let me know! Update: Michael Stahnke suggested I point to some resources on Gentoo packaging, for anyone interested, so take a look at the Gentoo Development Guide. The Developer Handbook contains some further details on policy as well as info on how to get commit access by becoming a Gentoo developer.